Making decisions can be hard, especially with the stress of finals and moving out of the dorms for the Winter. Luckily, we can help make those decisions during the moving process a little easier – no need to call mom on this one! First off, what do you need stored? Go through your belongings and decide what needs to go into storage and what needs to just go. This means throwing out anything you won’t be needing for the new year. Once you know what needs to go into storage, you can decide which storage option is best for you. At Door To Dorm we offer several boxed storage options. Cue James Corden and Justin Bieber – big box, little box, cardboard box. You can choose from four large boxes, baby humongous, or our most popular storage option, humongous box. We can hook you up with sturdy and durable boxes. We are also able to store much more than boxes, like Door To Dorm refrigerators and microwaves. But wait, there’s more! We store miscellaneous items like luggage, furniture, different sized plastic containers, beds and futons, rugs, and TV’s too!. Our goal is to make your life as easy as possible, which is why we offer FREE packaging materials including labels, tape, pick up, local storage and return delivery to your desired location. See? Packing and storing with Door To Dorm is seriously so easy! Take it from the pro’s, one of the most common mistakes when getting ready to leave for break is rushing during the packing process. We get it, you’ve been there for a few months and are ready to go home, but you don’t want anything to get lost or broken right? A few things to remember when packing is to be mindful of what you’re putting inside of each box. You want to make sure everything is secure..
You can use other items of yours as “fillers” such as clothing, towels, blankets, or even just some crushed newspaper or bubble wrap to ensure your things don’t shift around. This is perfect for your fragile belongings, and boxes with these items should be labeled as so! Click here to order extra packing materials to keep your belongings safe and secure. Secondly, when are you returning? If you’ll be back by spring, you might just need our 30-day storage option. Otherwise, we offer long-term storage for those who might be studying abroad for the semester, or aren’t returning until a later date. We all know that East Coast weather can be brutal during winter. But rest easy knowing your belongings are safe and sound in our climate controlled warehouse, waiting patiently for your return. Click here to order your storage for the winter break. If you’re done with school, (Whoo hoo! You’re done!) you’ll probably want to get your stuff back home or even to your new home. We can get your belongings to your desired location without you having to lift a finger – you’ve worked hard enough! Our shipping services are also great for new students starting in the spring. We’ll get your stuff right up to your dorm room, so you can focus on other things when you arrive. Click here to check out our shipping services for both moving in and out of your dorm room or apartment. 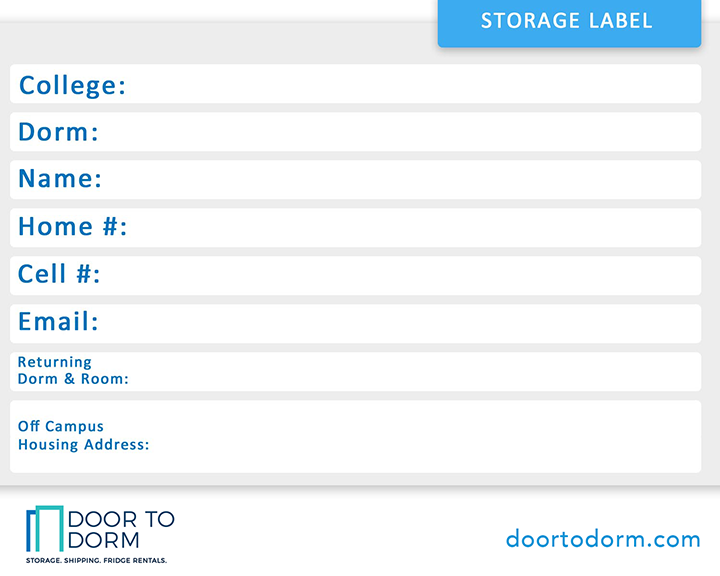 The bottom line is Door To Dorm has all of the bases covered when it comes to packing, storing and shipping. Learn more about our services and don’t be afraid to get in touch with any questions you may have for us!